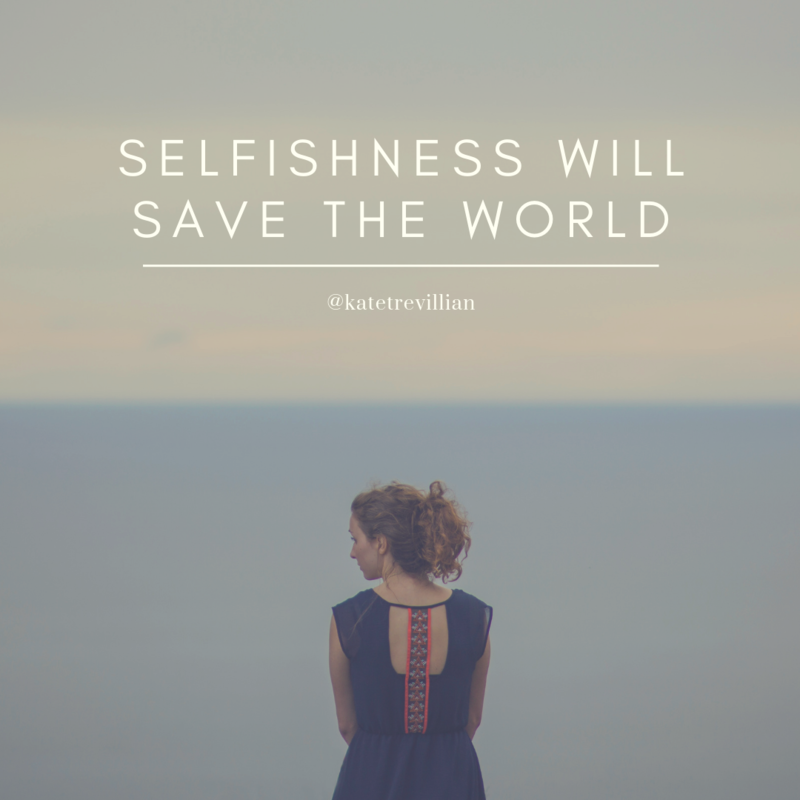 Selfishness WILL save the world! Yes, I can hear the collective gasp from here! And I acknowledge that it’s a pretty bold statement. Yet I believe it to be completely true. Let me start by clarifying what I mean when I say selfishness. I don’t mean the “stuff everyone else, it’s all about me and what I want” type of selfishness. That is what I call unresourceful selfishness. No, I am referring to the resourceful type of selfishness: the kind that recognises that if we don’t put ourselves first sometimes/often/whenever needed then the quality of the time and attention we give others is diminished. Not only that, but the quality of our work as well as the quality of our health/vitality is diminished, and it’s the latter that really dictates the quality of our life. I have worked with so many amazing clients who, when they came to me, were close to burning out. They were tired, depleted and unsure of how to break the cycle that they were in. They were brilliant at what they did whether it was in the workforce or at home, yet they had become so good at putting everyone else’s needs first that there was nothing much left in their tank. This not only caused them unhappiness and distress: the quality of their entire lives was impacted. A fantastically gifted person whose talents, attributes, and energy are now so diminished means they no longer shine brightly and contribute to the world in a way that fills them up and supports life around them. I feel like there should be that sound effect from the Minions’ at this point, the one that indicates imminent disaster… dur, dur DURRRRRR!! It took me a little while to work out that the behavioural trait which was missing for these clients was selfishness. Not consideration, not empathy, not thoughtfulness. This was about helping them see that by being more selfish, they are actually being the best version of themselves. The Merriam Webster Dictionary defines selfish as: concerned excessively or exclusively with oneself; seeking or concentrating on one’s own advantage, pleasure or wellbeing without regard for others. Reading that brought up that uncomfortable feeling in me, but in reality this is EXACTLY what those clients needed. To START listening to their inner voice before anyone else’s. The world really needs energised, vibrant people to keep moving it in a positive direction and depleted people don’t create energised environments. So: How can we keep ourselves more “filled up”? We make it okay to take care of ourselves…..even when others don’t like it. My own journey through life has involved the realisation that there is actually a good type of selfishness – resourceful selfishness! Without it being well-developed, I was in danger of giving way too much to others whilst caring little about myself, and that is indeed the polar opposite of selfishness. It’s a bit like anger. There is resourceful anger and unresourceful anger, although when asked many people see anger as a negative emotion. If you are like those clients I spoke of: burnt out, tired, frustrated, and disillusioned with life, I invite you get selfish! Just try it for a week and see how it goes. If you don’t like it, you are always welcome to put it down.